Tip: Use good quality ingredients – have a chat with your local butcher to find out where they get their meat. Using good produce will not only help your meals taste great but they’ll be more nutritious. Nice to see you again foodies! We’re just back from a BBQ Safari Trip of the USA and full to the brim of new tasty ideas to try out in our kitchen! This month we’ve come up with an absolute gem of a recipe! A ‘Slow Cooked Beef Brisket’ – big enough to feed all your family and all your friends too. This recipe is heavily influenced by our trip to the America (the home of the BBQ!) and perfect for the summer. Barbecuing in its truest form is so much more than just grilling your favourite ingredients. It’s a process of slow cooking the meat using different woods that add amazing flavours. The chefs in the US have fine-tuned this cooking style into an art form. The Beef Brisket takes a little bit of planning because its slow cooked but trust us it’s worth it! Here’s the ingredients you’ll need – happy cooking! Allow Brisket to come to room temperature, mix all dry ingredients together and store in an air tight container. Allow for 25g of rub per kilo of meat. 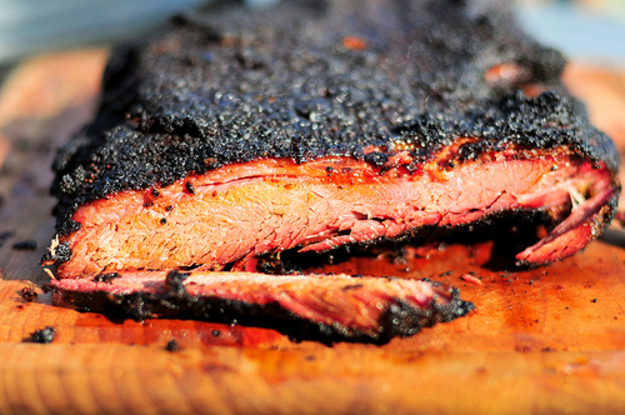 Rub all over the brisket and massage into every crevice. Wrap in cling film and leave overnight. Remove cling film and place on a rack within a deep baking tray. Place into hot oven and reduce temperature to 100C. After 3 hours cover with wet parchment paper and then cover tray tightly with tinfoil. Cook for a further 10-15 hours, ideally overnight. When cooked, wrap in fresh parchment paper and allow 45mins to rest. Serve warm, sliced with fresh bread, coleslaw, salads, pickled onions & gherkins. We’re all about keeping up with the latest trends in food and our chefs absolutely love trying new ideas. If there’s anything you’d like to see in our recipe of the month please send us a little message and we’ll have our chefs come up with something you can try at home yourself. Thanks for dropping by and see you next month!